Talk about creativity, right? The concept’s pretty simple, and it starts with this — every realtor or home stager out there needs some form of marketing, or some way for a message to stick in the mind of a prospective buyer. So when running an open house, there’s no doubt cookies and baked products on a table right in front of the front door does make a statement? But wouldn’t you agree — custom jelly beans do even better? OF COURSE! And that’s the genius of it. Whoever invented the vending machine had to have been a genius. Literally. The ultimate feeling of simply turning a crank and getting a load of goodies may have been a whole lot better than just picking up some candy. It almost juices the mind with euphoric feelings. We all have felt that way: back when we were kids. So what a realtor needs to do is get with BRAVA Marketing and simply buy just ONE of these machines. Branded in his/her name. And the rest is history. Heck, you can get jelly beans so easily, with very little cost, little time to prepare. It’ll cost less (no need to buy flour, sugar, or any of that). Stock up, fill up, and you’re good to go. The main bonus, obviously, is that, well, you can’t brand your cookies. Let me rephrase: you can, but it won’t look very pretty. This method of promotional marketing instantly resonates with a prospective buyer, and they’ll always remember: HEY, YOU’RE THE AGENT WITH THE CANDY MACHINE! And it’ll stick. In a big way. So What Are You Waiting for? Your Next Big Home Sale Is Right Around the Corner. You just need to sweeten the deal. Get people excited to bid. Also check out some of the other products we have right here, and then contact us right away when you’ve made your choice! Just don’t forget about the machine. That’s a must. Crank it up. Don’t try and deny it: as a kid, it wasn’t just about the candy. It was about the way it looked. Or the way you got it in your hands! Think back to the day of when candy stores were the actual product itself, and the candy was just what you got out of it. It was almost like presentation was just as important as the product. Hence why pez dispensers were so popular, and why custom branded jelly bean dispensers would make an ENORMOUS killing in a candy store in ways you never thought possible. Imagine the smiles on kids’ faces. They walk into the candy store and look at all the colors. Then they see the most awesome ways they can get that candy, because really the process of getting that candy is just as important as eating it. 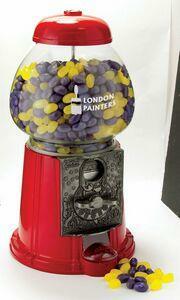 The bonus of custom branded jelly bean dispensers is that you can even sell them as well. You tie the feel and the image with the fact that a customer needs to come back and get more jelly bean product just to fill that dispenser up. Then the feeling never goes away. Obviously you can thank the likes of Harry Potter’s Honeydukes and Bertie Bott’s Every Flavor Beans, without a doubt. So in a way the nostalgic candy stores of our past are coming back. Truthfully, they should’ve never gone away to the commercialization that is walking down the grocery aisle and just grabbing a bag of Skittles. No, no, no. Kids can’t have that! They need…to have the experience. BRAVA Marketing certainly hit the mark with a product that’s so unique. 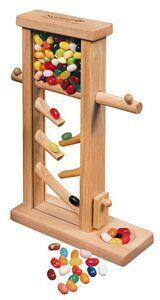 But we have more interesting products in custom branded jelly beans and other associated items. All you need to do is contact us right away and see what we can brand for you and your sweets. Just watch out for the toothaches.